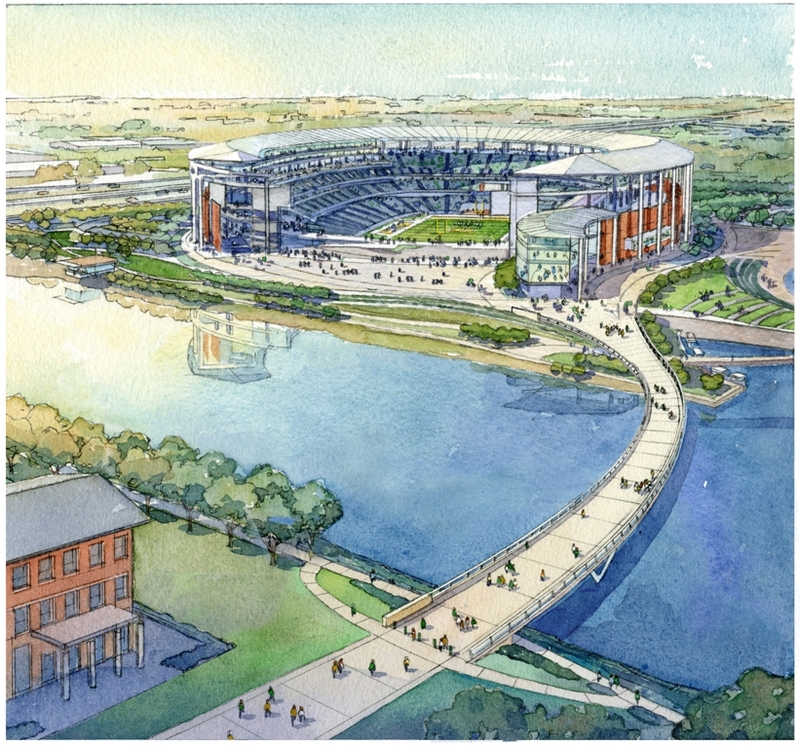 Artist's rendering of the Sheila and Walter Umphrey Bridge at Baylor Stadium that will be built over the Brazos River, connecting the new stadium with Baylor Law School and the Baylor campus. 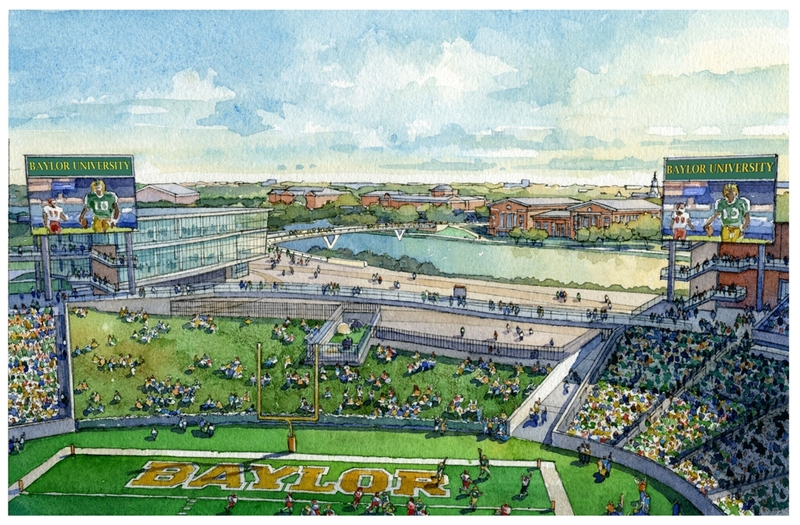 Artist's rendering which shows the endzone view of the Sheila and Walter Umphrey Bridge at Baylor Stadium that will be built over the Brazos River, connecting the new stadium with Baylor Law School and the Baylor campus. WACO, Texas (May 17, 2012) - Baylor University announced today that the university has received a major gift from Sheila and Walter Umphrey, BBA '59, JD '65, of Beaumont, for Baylor Stadium, the university's new on-campus football stadium. This generous gift - which ranks among the top 10 capital gifts in university history and top five gifts in Baylor Athletics' history - will support construction of the Sheila and Walter Umphrey Bridge at Baylor Stadium that will be built over the Brazos River, connecting the new stadium with Baylor Law School and the Baylor campus. Continuing the strong forward momentum for the stadium project, the Umphrey's gift follows two other announced naming rights gifts for Baylor Stadium. In March, Elizabeth and Drayton McLane Jr. provided a leadership gift that began the on-going fundraising effort to support construction of Baylor Stadium. On May 9, John Eddie Williams' gift named the field at Baylor Stadium, John Eddie Williams Field. "Baylor University is making enormous strides, and we believe this new stadium will be a showpiece, reflecting the University's remarkable progress and its strong standing in higher education," Umphrey said. "It is an honor for Sheila and me to attach our name to this significant walkway that will call attention to the quality and competitiveness of both Baylor athletics and Baylor Law School. We're delighted to be a part of this important project with our dear friends John Eddie and Sheridan Williams." "As a lifelong fan of football in Texas, it is exciting for me to be associated with the creation of the new Baylor Stadium and to do so in a manner that honors Walter's long standing connection to the University and to his beloved Baylor Law School," said Sheila Umphrey. "Walter Umphrey is an honored alumnus of both Baylor University and Baylor Law School, and a tremendously skilled lawyer who has distinguished himself inside and outside of the courtroom. When building a new Baylor Law School was only a dream, Walter Umphrey seized the vision and propelled the project forward by making an unprecedented gift to construct the Sheila and Walter Umphrey Law Center. Baylor now has one of the nation's finest law school facilities, helping to enhance the profile of our Law School in Texas and across the nation," said Baylor President Ken Starr. "Again, the Umphreys have answered the call during another transformational moment in the life of Baylor University. The new Baylor Stadium will keep Baylor on the national stage as a beacon in academics and athletics, a facility whose impact lifts not just our football program, but every aspect of our University. The Sheila and Walter Umphrey Bridge at Baylor Stadium will connect past to future and transform not just the shores of the Brazos River, but indeed our campus and our community, for generations to come. We are so grateful to Sheila and Walter for their enduring love and support for our University." 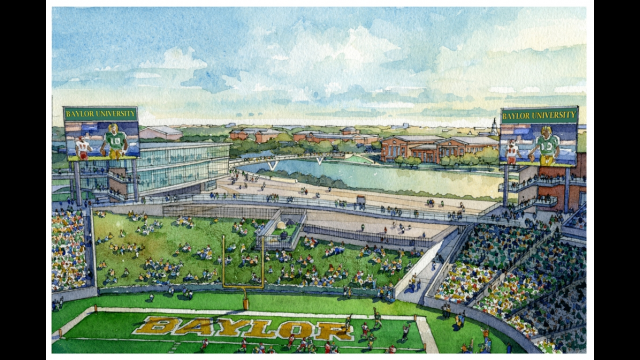 The new on-campus Baylor Stadium, which encompasses John Eddie Williams Field, is expected to be built on a 93-acre site on Interstate 35, one of the nation's busiest highways, traversed by more than 42 million drivers annually. 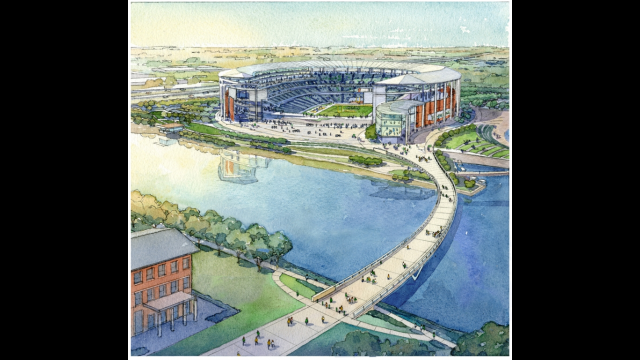 It will feature the Sheila and Walter Umphrey Bridge at Baylor Stadium crossing the Brazos River and connecting the stadium to the campus. The stadium will hold 45,000 spectators, with the flexibility to expand to 55,000 in the future, and feature canopy shading for half of all seats throughout the day, open concourses with views directly into the stadium, suites, loge boxes, indoor and outdoor club seating, designated seating for Baylor students and the Baylor band, and an event center and Stadium Club for year-round use. Born in Port Arthur, Umphrey received a football scholarship to Southern Methodist University then completed his bachelor's in business administration degree at Baylor in 1959. He earned his law degree from Baylor Law School in 1965. The senior managing partner at Provost and Umphrey Law Firm in Beaumont, Umphrey is well known as the lead attorney in the historic $17.3-billion settlement for Texas residents against the tobacco industry in 1998. That year, Umphrey and his wife Sheila gave $10 million - part of a collective $20 million gift from fellow Baylor Law alumni John Eddie Williams and Harold Nix - to help construct Baylor's Sheila and Walter Umphrey Law Center. He also has generously supported endowed scholarships at Baylor, as well as the Walter Umphrey Endowed Courtroom Fund for the benefit of the School of Law. Umphrey's dedication to the law in conjunction with the rights of individuals was inspired while being reared in the home of a justice of the peace. After earning his law degree from Baylor Law School, he joined the Jefferson County District Attorney's Office as a prosecuting attorney and ultimately Chief Felony Prosecutor. He is a member of the American Board of Trial Advocates and admitted to practice before the U.S. Court of Appeals for the Fifth Circuit, U.S. District Courts for the Eastern and Southern District of Texas, and the United States Supreme Court. His legal affiliations include the Port Arthur Bar Association, Jefferson County Bar Association, Texas Trial Lawyers Association, the American Association for Justice, American Bar Association and State Bar of Texas. He is a Fellow of the International Society of Barristers. From 2003-2011, he was included in the list of Texas Super Lawyers, an honor only 5 percent of the lawyers in the state are selected for annually. Texas Lawyer has recognized him as one of the top Texas lawyers of the 20th century in "Legal Legends: A Century of Texas Law and Lawyering" and as one of the 25 greatest Texas lawyers who have made outstanding contributions within the 25 years the newspaper has been published. His contributions to the legal community were recognized in 2010 by the Jefferson County Bar Association, which presented Umphrey with the Blackstone Award - the most prestigious award a Bar Association can bestow upon one of its members in honor of the lawyer's legal ability, integrity and courage. "We are deeply appreciative of Sheila and Walter Umphrey's passion for returning Baylor football to campus and their generosity will help make that a reality," said Baylor Director of Athletics Ian McCaw. "Time and again they have demonstrated their love for Baylor, and this gift is sure to enhance future game days as our fans travel the Sheila and Walter Umphrey Bridge to cheer the Bears to victory. "The Umphrey's gift, coupled with those Baylor has recently received from Elizabeth and Drayton McLane and their family and John Eddie Williams, continue to demonstrate that there is tremendous excitement, passion and support among the Baylor family for a new Baylor Stadium." "Sheila and Walter Umphrey have long been passionate about Baylor University, and this generous gift toward our new on-campus football stadium is another wonderful example of their love for Baylor," said Bears' head football coach Art Briles. "This is a gift that will tie the campus and stadium together for generations to come, and all of us associated with Baylor University are grateful for Sheila and Walter stepping forward to help turn this vision into reality." With a successful spring fundraising campaign, the stadium project could be completed in time for the opening game of the 2014 football season.